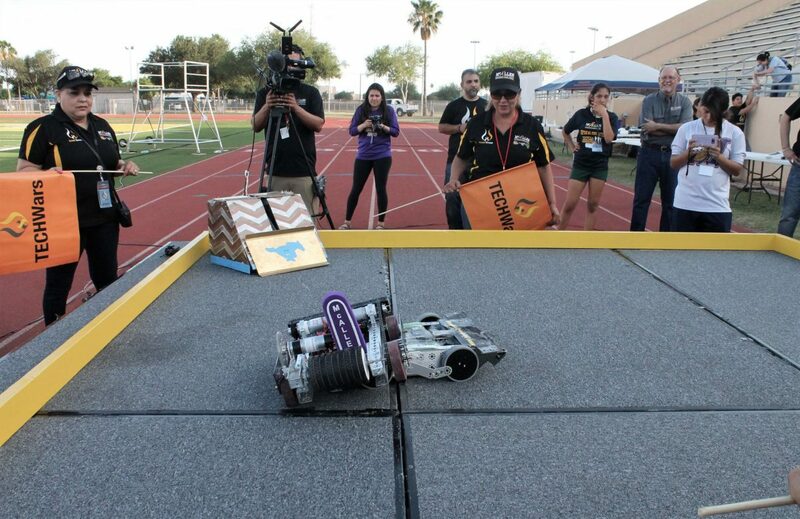 Nikki Rowe High School's "Rampage" Battlebot tries to flip over McAllen High School's "Big Mac" for the win during the Battlebot Competition at Tech Wars on Friday at McAllen Veterans Memorial Stadium. McALLEN — On the grounds where sports rule the field most of the year, a unique inaugural event was held Friday at McAllen Veterans Memorial Stadium for the district’s techies to show off their skills. 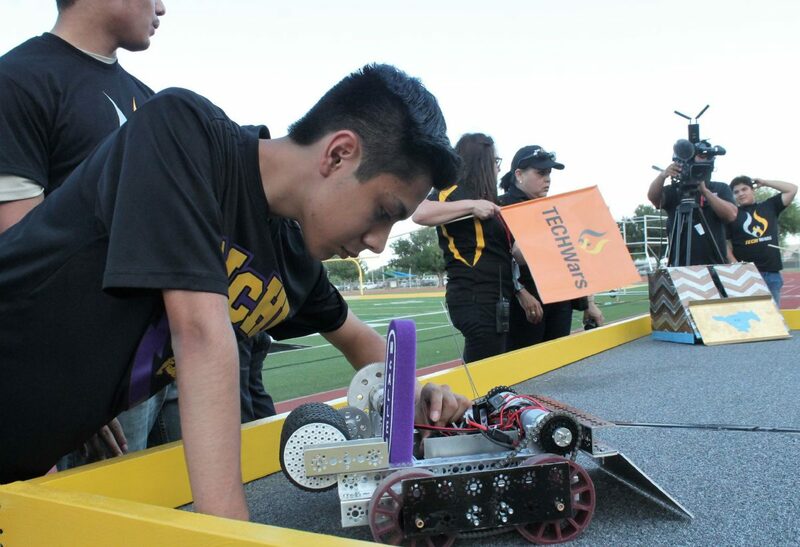 The McAllen school district developed the “Tech Wars” robotic competition to allow students to compete against one another. 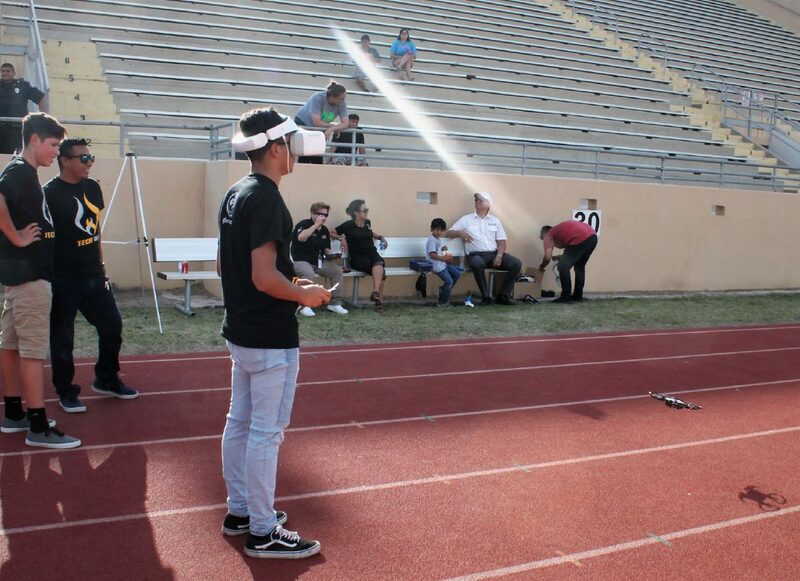 Drone racing, battle bots and unmanned vehicle competed on the football field while video gaming competition took place in the breezeway of the west side bleachers. McAllen ISD Superintendent J.A. Gonzalez was the force behind the idea of creating Tech Wars. Josue Cruz, from McAllen High School does last-minute work to their BattleBot "Big Mac" for before the Battlebot competition at Tech Wars on Friday at McAllen Memorial Veterans Stadium. Contestates make ready for the state of the Unmanned Truck Competition finals during the first annual McAllen ISD Tech Wars at McAllen Veterans Memorial Stadium on Friday, May 24, 2018 in McAllen. 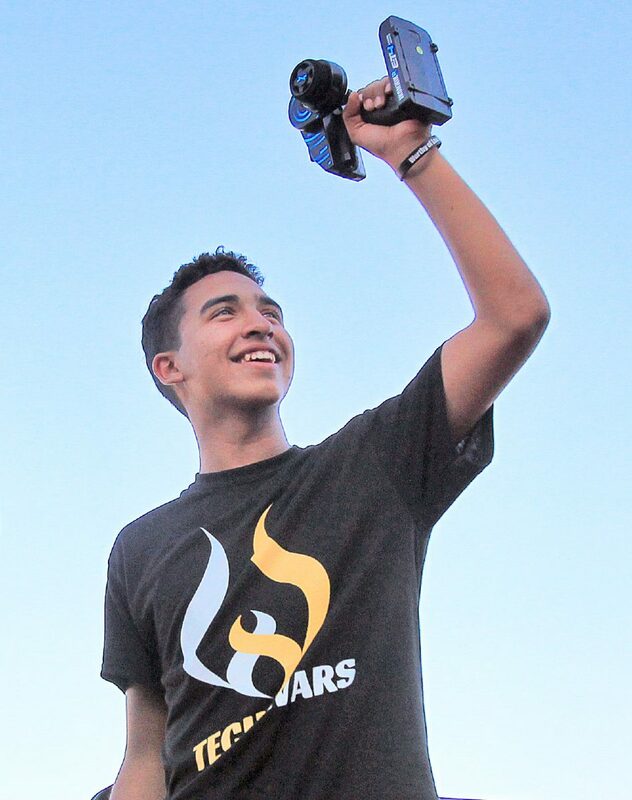 Jonas Rodriguez of Nikki Rowe High School celebrates his victory in the Unmanned Truck Competition during the first annual McAllen ISD Tech Wars at McAllen Veterans Memorial Stadium on Friday, May 24, 2018 in McAllen. Remote controlled cars run through the course during the Unmanned Truck Competition at the first annual McAllen ISD Tech Wars at McAllen Veterans Memorial Stadium on Friday, May 24, 2018 in McAllen. Daniel Alaniz from Nikki Rowe High School does a drone practice at Tech Wars on Friday at McAllen Memorial Veterans Stadium. Gonzalez said that as we move further into the 21st century, fields like medicine and engineering are becoming all about robotics. He predicted that society moving forward is going to be all about robotics. The district hopes to expand on the success of the first event. “Our dream is to have this stadium full one day and make it an invitational where we have other school districts and have multiple teams from other school districts here competing for points and competing to be best in the Valley,” Gonzalez said. The fierce battles began about 5 p.m. with the drone competition that featured about 125 students. Students from all three McAllen high schools participated including students from Achieve Early College High School, Lamar Academy and the Instruction and Guidance Center. Ann Vega, McAllen ISD’s director of instructional technology and library services, said it was an idea that began in August with the practice beginning in February. The drone track course occupied most of the football field and was shaped similar to a figure eight. Each team had to complete three laps around the course. The teams included a pilot who wore a virtual reality headset and handled the drone with a co-pilot serving as navigator. McAllen High School student Ada Cepeda was a pilot for her team. “ I really liked the communication I had with my partner,” Cepeda said. She said that competing on a space as large as a football field was a new experience for them. Following the drone competition was the Battle Bot Competition, where the three high schools constructed a fighting robot and fought for the win on a wooden platform by the track. 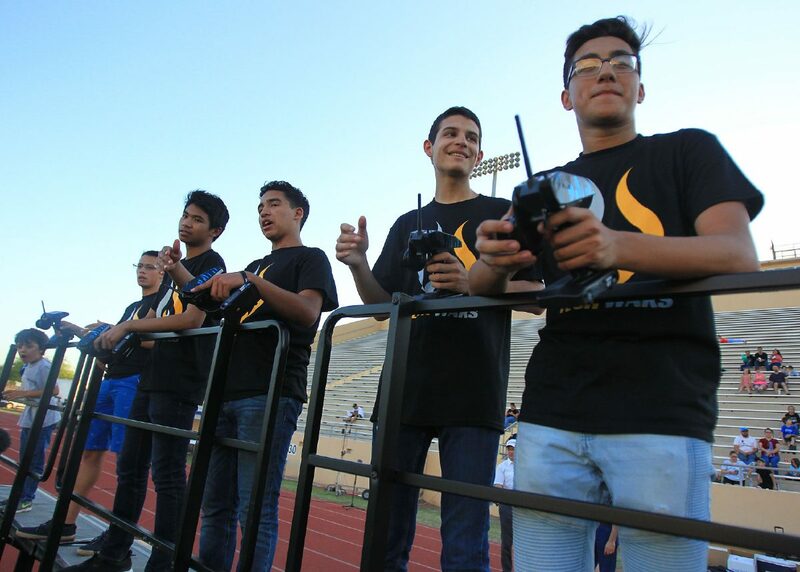 Nikki Rowe High School senior Xavier Gonzalez was the pilot of “Rampage” and along with teammates Nick Castillo, Noel Bazan and Miguel Martinez, used a strategy of survival to beat out the other teams. 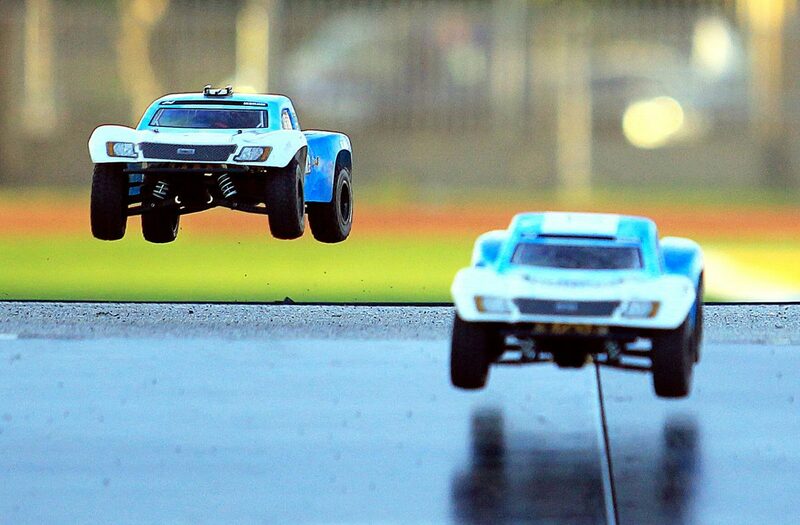 The night wrapped up with an unmanned vehicle competition where miniature modular trucks raced three laps around the field in a course similar in shape to the drone track. Winners received trophies and bragging rights for their school.